Again, you will be welcomed into our healing center with a smile. Please make yourself at home. We recognize your time is valuable and we take pride in limiting your wait time. You will be seen within 5 minutes of your scheduled time. We use state of the art equipment and techniques. Danielle will invite you back to one of the adjusting rooms. You can empty your pockets out onto one of the shelves and lay face down on the table. 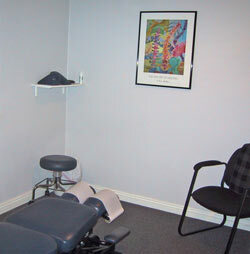 Dr. Jay Weber, D.C. will enter the room and perform a complete analysis of your spine. This time instead of explaining each and every imbalance detected, he will clear out these imbalances with a gentle adjustment. Once the adjustment is complete, he will answer any questions that you might have. After a quick stop at the front counter to pay as you wish and schedule your next visit, you are on your way to enjoy the rest of the day. Like a regular workout at the gym, each visit builds on the ones before. Enjoy the changes your body will go through as you regain your vitality and move towards reaching your potential. Total time needed for a regular visit is about 10 to 15 minutes. Call our Tustin Chiropractic office today! To schedule your appointment.